The SPEAKER KINGS Are Ready! Today we are very happy to announce that the highest estimated swedish announcer team with Mike Larsson and Lasse Westholm now are contracted for next year´s Malmsten Swim Open Stockholm! This weekend this duo of magic voices has taking care of the swedish nationals (an event with many great results by the way). 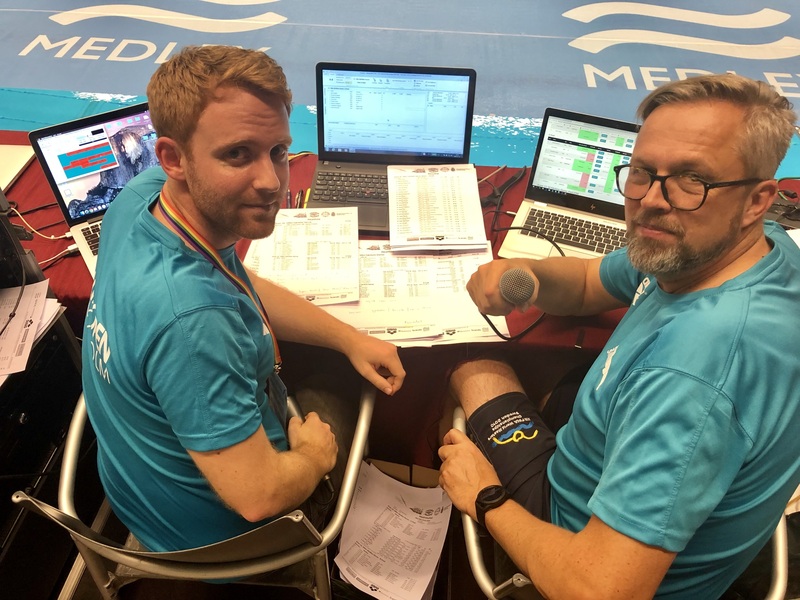 Next year will be the fourth Swim Open event for this duo, and we are very proud and greatful to have this kings of swim events behind the mic´s again - Welcome Mike & Lasse! Thank You and a Happy Easter! Desirable checks for the event! Watch Swim Open at Channel 9! Add your favorite Swim Open Music! Sweet Dreams at Swim Open! Don´t forget to buy your ticket! Why not try AQUA FRONT Analysis? Sarah - Achieved An Unique Quadruple Of Golds In Glasgow! Don´t wait with your Prel Entry Form to Swim Open 2019! RELEASEDAY INVITATION SWIM OPEN 2019! Get ready for Swim Open 2019! Super Sarah & Super Pieter! Swim Open Ends With Great Feelings! VISIT STOCKHOLM - A Great Visit! The Price checks - IS checked! Swim Open Is For Everyone! Are You The Happy Total Winner? Maja & Karl Return to Swim Open! MALMSTEN - New Titel Sponsor! Meet ARENA at the meeting! German Top Swimmers Checks in! Quality Globe Hotel Sold Out! We Proudly Presents The Nordic Swim Tour 2018! Get Ready For Swim Open Stockholm 2018! Last Day Report - A Great Ending! Day Three report - Fantastic! Day Two Report - A Great Day! Maja Broke The Swedish Record! A Great Start For Swim Open! See Swim Open Wherever You Are! The IRON LADY Ready For SWIM OPEN! Swim Open Tickets Almost Sold Out! Are You The Lucky Overall Winner? Are You A Medalist This Year? Try OLKA For Your Next Camp! Try Products From GREEN MACHINE! Katinka Hosszu To SWIM OPEN!!! Graz Checkes In For Swim Open! Giedrius Titenis Ready For Swim Open! Meet SWIMLAP on spot at Swim Open Stockholm! Ruta - Back Again For SWIM OPEN! Don´t Miss To Buy Your Ticket! Are YOU One Of The Winners? Herasimenia - Back for Swim Open! Gustavsvik - A Swim Open Partner! The Faroeses enters Swim Open Stockholm! Great German Swimmers to Swim Open Stockholm! Meet Simon - The Power Packed Swede! Henrik will be back for Swim Open! Stockholm - The best Swedish sport event city of this year! EUROSPORT 1 Will Broadcast Swim Open Stockholm 2017! SUPER SARAH Enter Swim Open Stockholm 2017! Star News Soon Coming Up! Congratulations to all great athletes in Rio! Invitation ready for SWIM OPEN 2017! SWISS Quality to SWIM OPEN! ANDREY GRECHIN ENTERS SWIM OPEN! Are you the overall winner? Which swimming star are you? ENTRYLIST - SWIM OPEN STOCKHOLM! Michael Jamieson Enters Swim Open! Team Greece To Swim Open! LUCA MARIN To Swim Open! HERASIMENIA Ready For Swim Open! Marco Orsi enter Swim Open!!! Meet the Prize ceremony Team! SVT do News Update at Swim Open! Enyoj the Oatly-Café at Swim Open! Be a VIP at Swim Open Stockholm! Great Results on Swedish Grand Prix! Buy your ticket for Swim Open! New Schedule for the Finals! Team Russia to Swim Open! Meet the Anchorman and the Dream Team! TV 2 Norge goes live! Israel Star - Gal Nevo to Stockholm! Swim Open Stockholm on Eurosport! The Great Icelander Eyglo Confirm Her Participation! More Polish Stars Checking In! New International Stars Coming In! Henrik Christiansen to Swim Open! Cameron van der burg ready for Racing in Stockholm! Marco Koch announce his participation! Race analysis for all finalists! The polish and the finnish national teams joins the swim Open Stockholm.